Full mouth reconstruction, is the restoration and rehabilitation of the mouth. It is the complete rebuilding and restoring of all of the teeth in both the upper and lower jaws when teeth that are poorly formed, missing, or fail in function. With proper planning and treatment, it is possible to restore teeth to a condition that is as good as or better than their optimal condition. Dr. Clausen uses 3D models and wax-ups of the proposed new crowns, and special appliances to ensure that the dental new bite is comfortable and very functional for the patient. Much like a smile makeover; facial aesthetics and smile, color, shape, and alignment of teeth, are all important factors in a full mouth reconstruction treatment. Whether the loss of teeth and/or function was caused by trauma, periodontal disease, or TMJ teeth grinding, we can help to rebuild a beautiful functional smile. Once the treatment planning phase has been completed, teeth are prepared for their restorations and temporary crowns are placed until permanent crowns are fabricated. 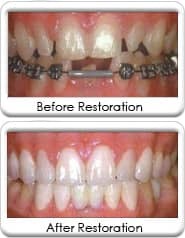 The result is a beautiful smile and restored dental function. Time to complete - Dr. Clausen requires several dental visits; these are based on the extensiveness of the reconstruction required. Fabrication of crowns and/or bridgework, may take between three to six weeks and additional healing time may be required taking up to eight weeks for the procedure. 1st procedure visit - Dr. Clausen will X-ray, create a dental plan and develop models for reconstruction. If dental implants are used, Dr. Clausen and his oral surgeon will select the number of implants and placement locations. 2nd visit - The oral surgeon will perform the implant placements. Dr. Clausen may use temporary crowns, bridgework, and/or a denture until the permanent dentures are fabricated.